Add the strongest (and sexiest!) 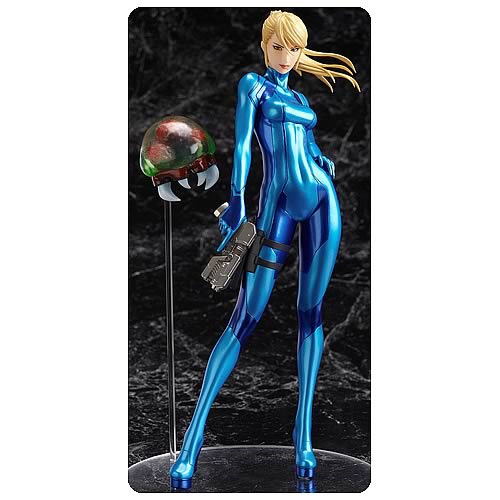 bounty hunter around to your shelf with this Metroid Other M Samus Aran Zero Suit Statue! Inspired by her appearance in Metroid: Other M on the Nintendo Wii, the 8 1/2-inch tall figure finds Samus in her blue Zero Suit so you can pose her like she's out on a mission. You get a Baby Metroid and gun, too. The Metroid Other M Samus Aran Zero Suit Action Figure really brings out the Metroid-world atmosphere for fans to enjoy! Ages 15 and up.